The first Chinese elector in a conclave, he has led since 1980the Holy Spirit Study Centre, a point of reference for the Church in mainland China. After replacing the combative Card Zen, he has urged Beijing to guarantee its citizens full religious freedom and human rights. 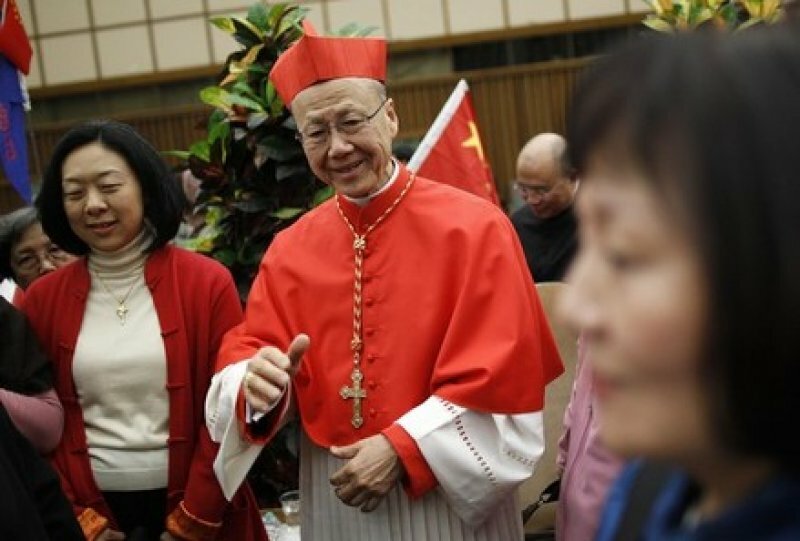 Hong Kong (AsiaNews) - Card John Tong, 74 in July, is the ordinary bishop of Hong Kong. He was the first Chinese elector in a conclave. Successor to the combative Joseph Zen at the helm of the diocese, he describes himself as a "man of dialogue". At the express will of Card John Baptist Wu Cheng-Chung, he has been in charge since 1980 of the Holy Spirit Study Centre, which publishes Tripod, an authoritative journal documenting the life of the Church in China. In this long interview given to AsiaNews right after his Episcopal appointment, the prelate talks about the progress of the mission in Hong Kong and the mainland, relations with the governments of Hong Kong and Beijing, and the difficulties with religious freedom. The bishop presents himself as a man of dialogue, but with "non-negotiable" principles, and calls upon China to guarantee its citizens full religious freedom and human rights. We all acknowledge that all the baptized should be missionaries and have the spirit of evangelization, following the instructions given to us by Our Lord. When I talk about evangelization, I like to propose two symbolic images: a water reservoir and washing hands. In Hong Kong, we have several reservoirs, and they are so necessary to sustain our life. The function of a reservoir is to receive and give water; otherwise, the water inside the reservoir will lose its freshness. Similarly, if we really want to make our faith always living and refreshing, we have to receive from and give to others at the same time. This is why I think that even in relation with the Church in China, we are not only giving, but also receiving. The two communities benefit from each other. The other image illustrates a similar concept. When we wash hands, we do not say that one hand washes the other, but rather that both hands wash each other, benefiting each other. Similarly, there is only one way to be a good Christian; that is to be a good missionary. Being Christian and having the spirit of evangelization are like washing hands; one hand cannot do without the other. We ask our Catholics to make ever-greater efforts in evangelization. Every year we have a good number of newly baptized. At the Easter Vigil in 2008, we had almost 2800 neophytes, mostly adults. At this Easter Vigil, we had a good number of newly baptized: 2730. We have also been sending out some missionaries to countries in Asia and elsewhere in the world: some lay missionaries to Cambodia, and priests to Tanzania, Canada and other countries. Although we do not have many local priests, we still encourage this missionary spirit within our community. Definitely. Hong Kong is a young church. Our faith still needs to be positively influenced by Catholics coming from overseas, especially those countries that have deep faith and a long Christian tradition. We appreciate PIME missionaries because they come from such an ancient Catholic country. They have brought to us many charisms, treasures and culture that are not only different, but can also be a positive model for us. Of course, the same should be applied to missionaries coming from other countries. Personally, I am very interested in learning new things from different countries and different cultures. We have missionaries from 30 different countries and Catholic faithful from about 50 nationalities. Hong Kong is an international community. I consider this a great blessing, because our faith and culture can be enriched. Regarding other religions, I think our relationships have been very harmonious. We try to follow the declaration from the Council Vatican II, Nostra Aetate, on the Relationship of the Church to Non-Christian Religions. We look forward to deepen friendship with members of other religions and join them in the service of society. At the same time, we uphold our principles. We always keep our faith in Christ as the only saviour of the whole world. In no way do we give up our principles. What are the most urgent problems in Hong Kong's society? Hong Kong is a cosmopolitan city, and one of the world's financial centres; therefore, our society and our people are deeply influenced by the global situation. Now we are facing the financial and economic tsunami. I fully agree with the Holy Father who issued a statement last Christmas and again on the occasion of the New Year. He spoke about the anxieties suffered by the peoples because of the economic tsunami. But, he said, we should not consider this as a crisis only, but as an opportunity as well. If we look it on an ethical way, we can turn crisis into an opportunity. We can rediscover the value of simplicity, fraternity and unity in the global family. If everybody lives a simple life, according to what one needs rather than pursuing material desires, one can rediscover the beauty of simplicity and get rid of egoism. Due to progress in communication, we are in a global family, or a global village. We should indeed learn how to live with each other, because we are all brothers and sisters. No matter which nationality or culture we belong to, we should help each other and live in solidarity. God has definitely offered enough resources for our needs. What is urgent and necessary is solidarity and justice. My relationship with the government in Hong Kong is not bad. I do not expect any special treatment from the government. There is no harm in having a harmonious relationship with the government, so that we can better serve the society. But we will never compromise on our principles and we will always uphold Catholic doctrine. Following the announcement of my instalment as the Ordinary of the Diocese, I have received some congratulatory messages from government officials in Hong Kong: the Secretary for Civil Affairs and the Secretary for Education. The latter, Mr. Michel Suen, sent me a letter although we met only on one or two occasions. So far, they have showed good will towards me. I appreciate their friendship, yet I will not forget to tell them what my bottom lines are, and what the Church's standpoints are. What about Education judicial case? What will you do? I always use one word to describe the rationale of my work regarding China for the last 30 years: SMART. This is the policy we have been following at the Holy Spirit Study Centre. The abbreviation stands for Small (we support projects that are small); Measurable (or accountable, there should be a system of checking projects); Articulate (all elements and stages of projects must be clearly stated); Results achieving (projects must deliver what was promised); Time bound (projects should start and be completed in reasonable time). We continue working with this policy. In this way, we can make our bridge-building ever more effective. I am not an ambitious man. If we can continue our work, building upon the trust that other people have been giving to us, we can make contributions to the Church in China and to the Universal Church. I was trained in scholastic philosophy and theology. Contra factum, non valet argumentum. (There is no valid argument against facts.) We have been making contributions in this way. So far, our work has been appreciated in many parts of the world, and in the Universal Church. We realize that our contribution is still limited, but we can help the Church in China to a certain degree. This requires right concept and vision, and then one needs effort and perseverance to implement the concept and to turn vision into reality, so that little by little reality can be improved. This is the way I think and do, and I know my colleagues share my viewpoint. These principles are useful not only for our work for the Church in China, but also for our spiritual life. Nowadays many Catholics go to China as visitors. Many of them can offer good influence and updated ideas to our brothers and sisters in China. The present situation permits some Catholics from China to come to Hong Kong. We make great effort to properly welcome them. The diocese has organized an ad hoc committee to receive them. We guide them to see the city, but we especially organize some meaningful pastoral exposures for them. They visit can some interesting churches, participate in church activities and visit some organizations within the diocese, such as the Liturgical Commission, the Catechetical Centre, hospital pastoral care units. So far, these guided tours have been highly appreciated. There is interaction. Our relationship goes in both directions: we go to China, and Catholics from China come to us. Some of our professors are still allowed to teach in China seminaries, but fewer than before. On the other hand, some of our priests and Sisters are invited to give retreats, spiritual guidance and spiritual meetings in China. The number is higher than before. I think God is always good to us. As an Irish proverb says: When God closes a door, then He opens a window. What are the priorities for the Church in China? Of course, I can play a role, as a Catholic, and as a leader of Hong Kong Catholic Church. I can lead the curia, clergy and laity to move forward toward the right direction. I have been playing this role for the past 30 years, and I will continue doing so. This is why I am staying at the seminary (rather than moving to the Diocesan Centre), and this is why I will continue to be the director of the Holy Spirit Study Centre. This is a bit exceptional, but when I mentioned it to people, they were not surprised, because they know how much I care about our work for the Church in China. I think it is ok. Yes, I would use this word: ok. My door of contacts is open, and so far the same is true from their side to me. At least we can talk to each other. As I have mentioned already in my public statement and at the press conference on April 16, I have my bottom lines. Firstly, I wish to show my openness and warm attitude toward everybody. But I cannot hide or sacrifice my principles and bottom lines. Therefore I will follow the Holy Father's letter. He has stated the direction for us to follow, and I will do just that. I am a member of the Commission for the Church in China, established by the Holy See. In the meetings of that Commission, I occasionally expressed my opinion openly, and I have noticed some of my opinions have been welcome by the Holy See. I have already checked my bottom lines with the Holy See. And holding firm to my positions, I can handle my dialogue with the Chinese government. Yes, I received congratulations from officials of the Chinese governments. The vice-director of the Liaison Office here in Hong Kong sent me a warm letter of congratulations. On April 16, after my press conference, the spokesperson of the Foreign Ministry in Beijing, answering a question from a journalist, talked about my appointment without any negative criticism. Official Chinese media has reported her statement. She mentioned the agreement with the British government about the principle of "One Country, Two Systems." She said she hopes that our relationships will improve, and she encourages the interactions between the Church in Hong Kong and the Church in China. Of course, she repeated some of their old lines, such as the principles of non- interference, non-subordination and mutual respect. At least she talked about me quite neutrally, and not negatively. Again, I would say that my relationships with Beijing are acceptable so far. You mentioned the Pope's letter to Catholic Church in China. How have the Pope's directives been implemented? What can the Holy See do to support the Church in China? Some people thought that I would lose my sleep after taking over Card. Joseph Zen's responsibility. But I can tell you that I keep sleeping very well for six hours every night. I know my limitations. But I trust in God, in Catholic teaching, and in the collective wisdom of the Catholic community. My predecessors built up excellent and healthy structures for the Diocese. We leaders should collect different opinions before making any important decision. We should have open eyes to see different situations and open hears to listen to different opinions. The Diocese is provided with a Pastoral Council, a Council of Priests, and various commissions. The Hong Kong church, although still young, is quite well established and structured. As one of the Vicars General for 17 years, I was in charge of the Bishop's office and of the Seminary, where now I am now still teaching few classes. I know my co-workers and colleagues in the diocese very well, and trust them. Therefore I can say: so far so good. I hope and pray that, with the help of others, I can manage my workload. I still find time to play basketball. As long as my age allows, I will continue do physical exercise. So my schedule is more or less the same as before. I appreciate Cardinal's Zen outstanding charisms, but I think the church does not rely in one person only, no matter how good he or she might be. We are a community. Tell us something more about yourself. You are the fist Hong Kong bishop who was born in Hong Kong! I was born in Hong Kong in a non-Catholic family. You are right. I am the first Hong Kong bishop who was born in this city (laugh). My father was born in Guangdong province; I do not know what village exactly. My mother was born in Macau. Her grandfather produced mantles for lights in Hong Kong. When she was a young girl she studied at the Sacred Heart School of the Canossian sisters in Caine Road. As mentioned, she was not Catholic. One day the school had the visit of Archbishop Mario Zanin,  the Apostolic Delegate to China visiting Hong Kong. The Sisters mobilized all the students to welcome the prestigious guest in the most solemn fashion. My mother was chosen, by the Principal, Sister Mabel Anderson, to present the flowers to Archbishop Zanin on behalf of all school. Maybe she was chosen because she always dressed nicely. She told us this episode many times, always feeling very proud of that privilege. Since then she had the highest respect for the Sisters, particularly for Sr. Anderson. The good impression about the church remained in her heart but, at that time, she did not receive baptism. When I was two years old, the Japanese invaded Hong Kong. My family had to move to Macau, and shortly after, to Canton. I was the only boy in the family. My father had an elder brother, who had a daughter. In the traditional family, boys were preferred over the girls. Therefore, for my protection, I was separated from my parents and sent to stay with my grandmother (on father's side) in a village in Hua County, Guangdong Province. Later, Hua County became part of the municipality of Canton (Guangzhou). My grandmother loved me very much and she protected me no matter what. One day there was not enough food. My grandma sent someone to the neighbouring village to borrow some rice. We got only one small bowl of it. So Grandma, who was very dictatorial, decided that I was the only one to have the rice. At that time I was proud, but later in my life I felt ashamed of that privilege. It shows the injustice of superiority of men over women in the traditional society. But I remember this episode with some fondness, because my grandma really loved me and took good care of me. So when I was in the Macau seminary and heard the news of her death, I cried a lot. In those years the fighting between Communists and Nationalists in northern and central China was quite devastating. Many wounded and destitute soldiers sought refuge in Canton. Every day I saw such people coming down looking for assistance. I witnessed how much the foreign missionaries, particularly my parish priest, Fr Bernard Meyer, MM, helped many in need. He really had the same love and compassion of Christ towards those in need. Fr. Meyer introduced my mother to teach in a school. In those days, a high school graduate like my mother was considered as having a good standard of education. So my mother became a teacher, even if she was not trained as such. Since I returned to Hong Kong, I have lived in the seminary all the time. This has been my only residence. I have been teaching theology, and later Chinese philosophy also. I was the Dean of Studies in the 1970s. In 1979 I was one of those invited to initiate the Holy Spirit Study Centre (HSSC). I asked to take a half-year sabbatical to update myself before the start of the HSSC. I travelled to the States and elsewhere for six months. Then I returned to Hong Kong and took up my new assignment. I was not alone; others collaborate with me. I have always thought that it is very important to work with others and to find the right direction together. Why did Bishop Wu choose you as main responsible for the HSSC? I do not know why Bishop John B. Wu chose me for this job. He did not tell me. Maybe he considered that I was raised in China; that I studied Chinese philosophy at CUHK. I received a M. Phil. (Master's in Philosophy) in the 1970s. In those years I was invited by Concilium, the theological review, to collaborate with them, and I took part to some international meetings. I was also occasionally invited to give talks outside of Hong Kong. In the diocese, I was the Dean of Theology, chairperson of Council of Priests, and chairperson of the Ecumenical Commission. I also was chairperson of the Association of Diocesan Chinese Priests. So I was quite active in the diocese. Sometime, I also did some writings for Cardinal Wu. Maybe these were the reasons why Bishop Wu chose me, but I cannot say with certainty. Many people from abroad went to pay a visit to Bishop Wu, and they asked what Hong Kong was doing about China. I remember with fondness that he was always very proud to introduce me to those people, saying: "Fr. Tong is now taking care of these things." The Bishop's call was a turning point in your life, wasn't it? Yes, you are right. This appointment was a turning point for me, because I had to travel and to participate in more international meetings. I started to be known by many people around the world who were interested in China. Many people would contact us at the HSSC before visiting China. Therefore we had to learn how to articulate our ideas, let them know what we think... And then we had to keep checking whether what we thought was right or not. So, step by step, we built up our knowledge and experience. This has been a great gift for us. It was God's providence. I think I am a mild person. I follow the Chinese saying, known also in Latin: In medio stat virtus (virtue is in the middle). I think it is important to be a man of communication and dialogue. Somebody once gave me as a gift a replica of a painting originally from Russia. I particularly like that painting: it is about the Annunciation. The angel brought a message to Mary, and she answered "yes" to God through the angel. Then she brought Jesus to the whole world. We have to follow in the footsteps of the Angel and of Mary in being persons of communication. When I talk about communication, I do not mean technique, but human communication. I find that giving and receiving are very important. I believe I am a simple and ordinary person. If just possible, I would like to do something good for others, as Ps. 23:6 says, "Ah, how goodness and kindness follow me all the days of my life." See "Card. Zen: "Government is heartless, disrespectful of Church regarding schools," in AsiaNews.it, 11 December 2006. . The principle 'One country, two systems' was the basis for the return of the territory to mainland China in 1997. It guarantees Hong Kong a wide degree of cultural and economic autonomy. Mgr Wu was bishop of Hong Kong from 1975 to 2002 when he was replaced by Joseph Zen. Mgr Tong was born at 8 Staunton Street in Mid-Level. The house where he was born is now home to a popular restaurant, Pepperoni's. Before Hong Kong was returned to mainland China on 1 July 1997, tens of thousands of residents left the territory seeking refuge abroad out of fear for the consequences of the political changes. Mgr Tong obtained a Master in Philosophy from Hong Kong's Chinese University in the 1970s.